Here are all the major stats and numbers recorded during Australia big win in Canberra’s Test debut. 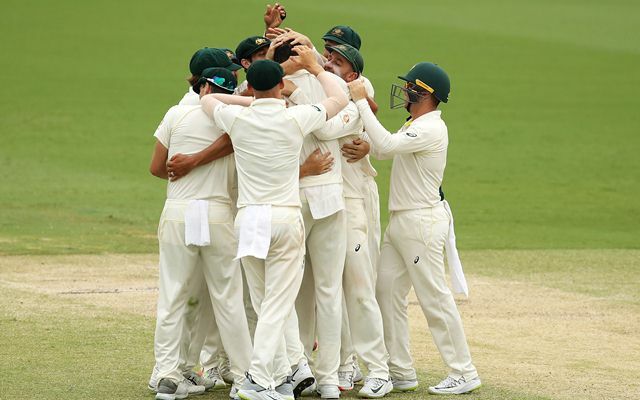 Australia completed a series win over Sri Lanka in the 2-match Test series as they defeated the visitors by 366 runs during the 2nd Test in Canberra. This was Australia’s first Test series win since the Ashes victory in last summer. This was also their first series win in International cricket of two or more games since the Ashes win. Joe Burns (180), Travis Head (161), Kurtis Patterson (114) and Usman Khawaja (101) scored centuries for the hosts while Mitchell Starc claimed 5-wicket hauls in both the innings. 6 – Number of 5-wicket hauls for Mitchell Starc in Test cricket against Sri Lanka; the most by any player. The likes of Shane Warne, Junaid Khan and Yasir Shah had as many as five 5-fers against the Lankans in Tests. 2 – Tim Paine declared Australia’s first innings when batting on 45. He thus became only the 2nd captain in Test cricket history to declare during the team’s first innings while batting in the 40s. Another Australia captain, Ray Lindwall declared when on 48 during Australia’s first innings against India in 1956. Only two other captains declared the innings when they were ten or fewer runs short of a personal milestone in Test cricket during the team’s first innings. Imran Khan was unbeaten on 93 during the 1991 Sialkot Test against Sri Lanka while Nasser Hussain on 146 in the 1999 Durban Test against South Africa. 3 – Paine is only the 3rd Australian captain to declare the innings ten or fewer runs short of a personal individual milestone during the innings in Test cricket. Greg Chappell was unbeaten on 48 when he declared Australia’s 2nd innings against during the 1976 Test against England while Ray Lindwall also declared while batting on 48 during Australia’s first innings in the 1956 Mumbai Test against India. 6 – Dhanajaya de Silva became only the 6th Sri Lankan to be dismissed via hit-wicket in Test cricket. Last SL player to dismissed this was in Tests was Nuwan Pradeep in the 2014 Lord’s Test against England. Romesh Kaluwitharana got out on two different instances. 2001 – Pat Cummins took 10-wicket match haul in the first Test while Mitchell Starc in the 2nd Test. This is the first series since 2002 where two Australian bowlers bagged ten wickets in a series. The last such series for Australia was the 5-match home series against Windies in 2001. 2004 – The last occasion of Australia witnessing two of their players bagging 10-wicket match hauls in consecutive Test matches was Shane Warne in 2004 also during a series against Sri Lanka. 2005 – The last instance of two 10-wicket match hauls for Australia in a Test series was during the 2005 Ashes. Shane Warne was the bowler with both 10-wicket hauls during the series for the Aussies. 6 – Usman Khawaja now has scored centuries at six Australian venues – Canberra, MCG, SCG, Adelaide, Gabba, Brisbane and WACA. All his eight centuries in Test cricket have come at eight different venues. Steve Waugh, Matthew Hayden and Ricky Ponting scored Test centuries at seven different venues in Australia.